The Houston Better Business Bureau awarded Rockwood Shutters, Blinds & Draperies a 2017 Pinnacle Award for customer service excellence. Rockwood Shutters, Blinds and Draperies received a prestigious 2017 Pinnacle Award at the annual Houston Better Business Bureau’s Awards of Excellence luncheon at the Bayou City Event Center. 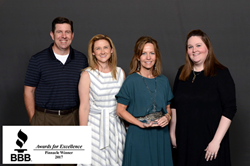 On May 10th, the Better Business Bureau Education Foundation honored BBB Accredited Businesses and Charity Members that maintain a superior commitment to ethics, overall excellence, and quality in the workplace at the 2017 Awards for Excellence event. In recognizing businesses and non-profits for their achievements and commitment to quality in the workplace, Rockwood Shutters, Blinds and Draperies was one of 292 companies recognized at the annual Better Business Bureau Awards of Excellence on May 10, 2017. Multiple Winners of Distinction (finalists) are chosen in each category and from the group of finalists, one business is chosen to receive the Pinnacle Award. This was the second time Rockwood Shutters, Blinds and Draperies was recognized by the Better Business Bureau for service excellence. Headquartered in Houston, Texas, Rockwood Shutters specializes in manufacturing interior window shutters and selling complete window treatment solutions for any window. The very best of traditional craftsmanship is seamlessly integrated with the latest technology and engineering innovation in the state-of-the-art Texas manufacturing facility. Every order received is custom manufactured to the exact window dimensions and characteristics in accordance with the design specifications. Rockwood barn doors and window treatment solutions, including shutters, blinds, and draperies are available around the country and include complimentary in-home design consultation with professional installation. Rockwood is relentless about providing quality products with features that are unique in the industry.